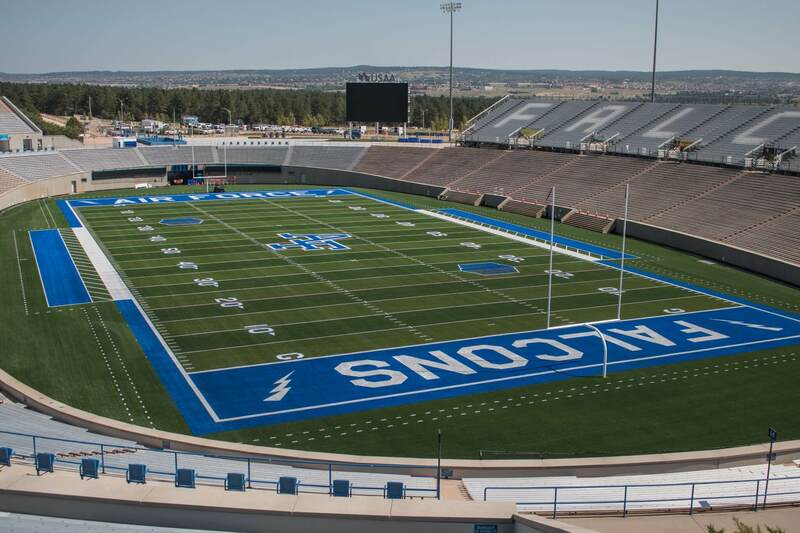 U.S. AIR FORCE ACADEMY, Colo. — Air Force football fans will have even more reason to cheer this season when the Falcons kick-off their first home game Sept. 1 in an upgraded stadium. Falcon Stadium has recently undergone a partial renovation including new synthetic turf, scoreboards and an updated home-team locker room. The Falcons will also debut new “heritage uniforms” for the first home game. On Aug. 18, fans got a preseason look at the phase one improvements during Fan Day, where they got a chance to visit with the team and staff at Falcon field. “We believe these updates, plus those slated for next year, will enhance the stadium experience for our fans and cadet athletes,” said Lt. Gen. Jay Silveria, Academy Superintendent. The renovations are part of a two-year $19 million improvement project that will include improving west-side public restrooms, adding elevators to assist disability access, upgrading utilities and the visitor locker room. “We’re diligent about maintaining our installation and always look for ways to enhance what we provide,” Lt. Col. Jimmy Jeoun, commander of the 10th Civil Engineer Squadron said.